DERRY, N.H. — Jeb Bush’s standard stump speech seemed to take on new meaning Thursday when his mother, former First Lady Barbara Bush, joined him on the campaign trail for the first time since he announced his White House bid last summer. Barbara Bush sat directly behind her son, alternating between applause and intent listening as he delivered his standard campaign speech that caused him to choke up at least three times. The emotion came as Bush talked about his dad, the 41st president, calling him “the greatest man alive” and when telling the story of his daughter’s drug addiction and recovery. Those are both lines Bush regularly uses in his campaign speech, but appeared to have greater meaning with his mom in the room. 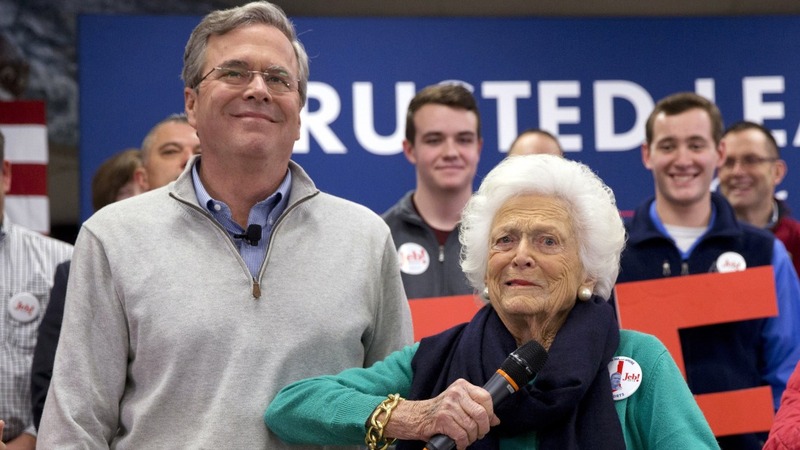 Thursday’s appearance by the Bush matriarch came at the same time the super PAC backing Bush’s campaign released a television ad featuring the candidate’s brother, former President George W. Bush. Campaign aides have hinted that the former president will make his own appearance on the trail in coming weeks. “I cannot tell you in the 90 versions of town hall meetings I've done all across this state how many times people came up and said ‘our mother – I love your mother, I love your mother,’ just over and over again,” he said.